A couple of years ago Kato released Caltrain Nippon Sharyo Gallery cars through their Kobo custom line http://www.katousa.com/Kobo/. The only irksome thing about these is that Kato used the Metra stripe pattern rathern than the Caltrain chevron pattern for the front of the cab coaches. Athearn also made Bombardier bilevel coaches (mainly used with the MP36PHs in Baby Bullet service), but they go for an arm and a leg on eBay and have been long out of production. Now if only another manufacturer *cough* Kato USA *cough* stepped up to produce these. Also slightly surprised that Athearn made the F59PHI in Caltrain livery. 923 is one of Caltrain’s MP36PHs (Kato sells these as a Kobo customs, too http://www.katousa.com/Zcart/index.php?main_page=product_info&cPath=157&products_id=1372), but I can see the similarities between the two locomotives. I know someone that can repaint and decal the Metro Nippon Sharyo Gallery Cars, I had some done and left the cab cars as they are but you can request to have the chevron pattern on the ends. Let me know if you're interested and I can connect you with him. As for the Athearn cars, those are difficult to find nowadays - there was a limited re-release a couple of years ago and they retail was $140 for 3 cars. A hobby shop in Anaheim had a couple of 3 car sets when I was there in September. Here's the link. I'll send you some pics of Caltrain cars that I had painted. Thanks serotta1972. Please send me the contact. 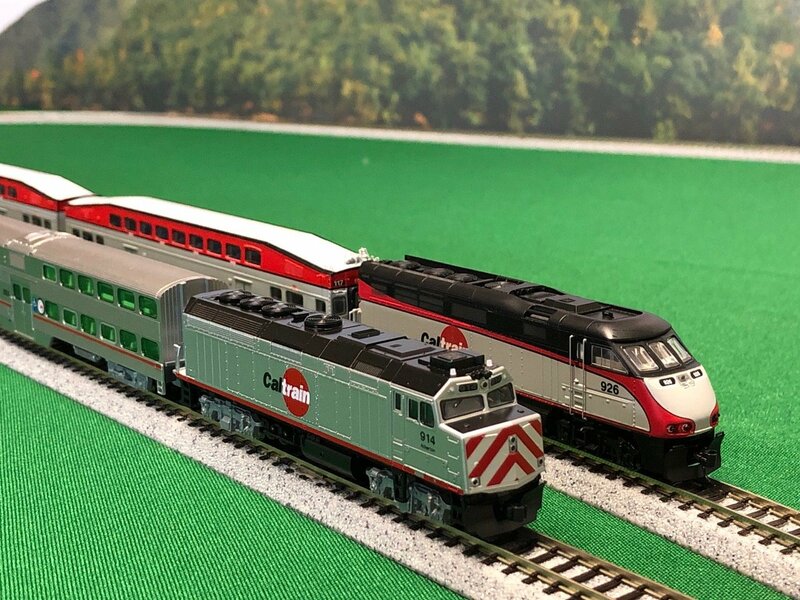 Here are pics of the my Caltrain commuter trains. I will post more when I find the other pics. 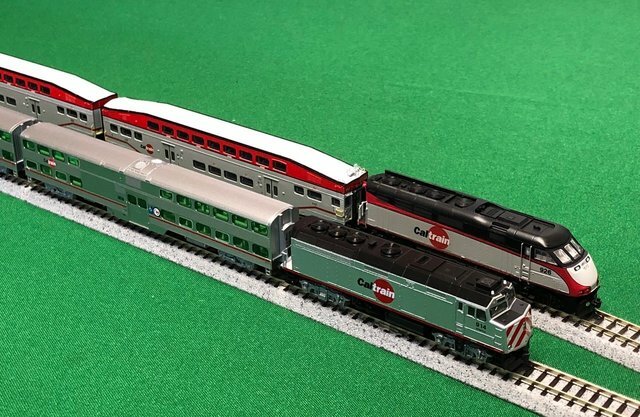 Has anyone put a sound decoder in the Kato F40 caltrain locos? Looks like MRC has a drop-in version for F40PH but I am not sure what the quality of MRC decoders is like. Again, I am not personally familiar with the KATO USA stuff and relied on the TCS website for this info. That one would work too. Sorry I missed the word "sound in your original post. I took serotta1972's suggestion and had the metra cars repainted. Here they are! Wow those look great Kiran! I love the layout too, looks like a lot of fun. Nice layout! F40PH with these is the perfect prototypical consist. This repaint looks top notch, they're better than the Kobo custom repaints. Thank you! The layout is a 4 track mainline loop with a scissors turnout and 2 double track single crossover. Those single crossovers are giving me trouble with DCC.